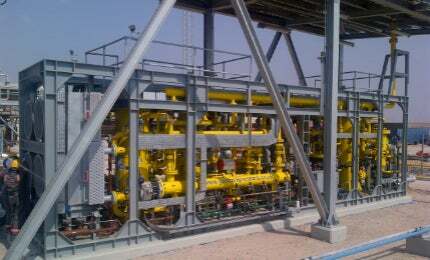 Gas Compressors Ltd (GCL) specialises in customised gas compressors and booster packages. The company’s products are used in the power generation, Oil & Gas, refinery, landfill, water and petrochemical industries. GCL’s engineers have many years’ experience in the design, manufacture and installation of gas compressor systems. Customers can use the company’s experience and products to optimise machine selection and gain an economic advantage. GCL can supply, install and full commissioning its range of products worldwide, from bare shaft machines to complete turnkey packages. The fabrication process takes place in the company’s two UK workshop, performed by in-house coded welders. GCL’s lifting equipment can accommodate skids of up to 25t. GCL also designs, builds and programmes their own control/MCC panels as well as performing HYSYS process calculations. When selecting technology for a particular application, GCL studies the advantages and disadvantages of the various generic types of machine available in order to provide the best combination of reliability and economic benefits. The company is not tied to specific suppliers and customers can be sure that the optimum solution will be designed and installed at their plant. Oil-flooded screw compressors are frequently used for higher pressures of up to 45barg in cast steel versions and are commonly used for fuel gas boosting. Alternative compressor technologies can be used such as centrifugal or oil free screw compressors for special applications. GCL can also build gas conditioning skids and pressure regulator packages, in addition to booster systems, to offer our customer the full scope of equipment from process line inlet to the turbine. GCL works with almost all gases, including fuel and industrial gases, refrigerants and refinery gases, and fabricates pipework measuring up to 36in at its workshop. Gas Compressors will be attending this years POWER-GEN Europe. A selection of Gas Compressors Ltd projects from the last few years. Gas Compressors, a company that supplies customised gas compressors and booster packages, has created a profile listing its most recent projects. Gas Compressors will be attending the PowerGen Europe 2015 exhibition from 9 to 11 June 2015 in Amsterdam, The Netherlands.